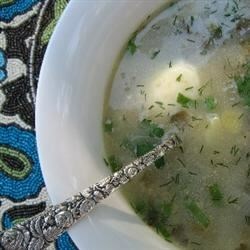 "This highly-unusual spring or summer soup was called 'green borscht' in my family. It's served chilled and is very pleasant and refreshing." Fill a large pot about 3/4 full with water; bring to a boil. Add diced potatoes and cook until fork-tender, 8 to 10 minutes. Stir in green onions and cook another 1 to 2 minutes. Stir in spinach and sorrel; cook another 2 to 3 minutes, or until wilted; remove from heat. Pour the beaten eggs into the mixture in a slow and steady stream, stirring constantly, until the soup thickens. Season with salt, sugar, and vinegar to get a slightly sweet and tangy taste. Pour soup into a large bowl; allow soup to cool before transferring to the refrigerator to chill completely. Garnish with any combination of cucumber, chopped egg, sour cream, and dill. We really loved this soup. I wasn't able to find sorrel but I used spinach instead. If I can ever find sorrel I will try it with that. Great soup to have on a cool spring day.